23 year old female G1P0 taking fertility drugs complains of abdominal cramping and vaginal bleeding. Explain the clinically relevant anatomy of the female pelvis. Describe the indications, contraindications and pitfalls of CUS for first trimester pelvic pain and bleeding. Perform ultrasound protocol including transabdominal and endovaginal views. Understand the role of CUS, consultative US, and quantitative b-hCG in a clinical algorithm. Describe the differential diagnosis for first trimester pelvic pain and bleeding including intrauterine pregnancy, embryonic demise, molar pregnancy, ectopic pregnancy, and indeterminate classes. 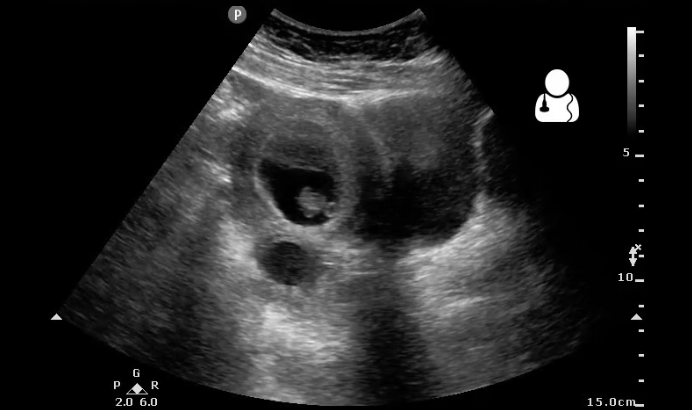 Recognize CUS findings and pitfalls when evaluating for early intrauterine pregnancy and ectopic pregnancy including recognition and location of early embryonic structures, direct and indirect findings of ectopic pregnancy and adnexal masses. Jang T, Ruggeri W, Dyne P, Kaji A. Learning Curve of Emergency Physicians Using Emergency Bedside Sonography for Symptomatic First-Trimester Pregnancy. J Ultrasound Med. 2010;29(10):1423. Bloch AJ, Bloch S a, Lyon M. Correlation of β-human chorionic gonadotropin with ultrasound diagnosis of ectopic pregnancy in the ED. Am J Emerg Med. 2013;31(5):876–7.